Su Tong is a top author in the world's most populous nation, but he shrugs his shoulders and insists, ``My books don't sell." Su Tong says writing itself fulfils him. The author, who shot to fame in 1991 when one of his novels was made into the Oscar-nominated feature film ``Raise the Red Lantern," blames the dwindling sales on rampant piracy and a growing disinterest in literature among Chinese. ``Nobody reads anymore," Su Tong says. ``They are all trying to earn money." In Singapore for a literary festival, the 40-year-old writer slouches casually into a chair at a four-star hotel and chats easily about his favorite American authors - Raymond Carver and Ernest Hemingway - and the problems of being an author in China. ``At first I thought it was me, my books, that were going out of fashion," Su Tong says. ``But then I found that authors more famous than myself weren't selling either. Now I understand the market. There are just fewer and fewer paying readers." Su Tong says that 10 years ago a publisher might print 100,000 copies of one of his books on the first print-run, but now they print just 50,000. ``Or at least they tell me it's 50,000," Su Tong says, suggesting that many publishers print more and cheat their authors out of profits. Chinese literature professor and translator Howard Goldblatt of Notre Dame University in the United States says Su Tong is not the first to complain about this phenomenon. He remembers walking with Mo Yan, another leading literary light in China, in Beijing several years ago and seeing the writer's latest novel for sale at street-side book stalls before it was even published. According to a May 2003 article in US trade magazine Publisher's Weekly, China's book business has actually seen tremendous growth since the government began to loosen restrictions on who and what can be published several years ago as part of its overall economic liberalization scheme. But earnings for authors and publishers alike are increasingly being compromised by ``rampant unethical publishing and copyright infringement," says the article written by Teri Tan. ``It truly has come to the point where the best writers can only gain concrete rewards by having their books translated and published out of China, or by having them picked up by TV producers, and the like," says Goldblatt, who has translated two of Su Tong's novels into English. But piracy may not be the only reason Su Tong's books aren't selling. Amid the hectic growth of China's fast-paced economy, many seem to have lost the patience needed to savor a novel and are instead turning to film and television for distraction. ``A few decades ago in China no one had a television," Su Tong says. ``Six out of 10 people, if they were literate, would be spending their time reading novels. Not anymore. It's a multimedia society now." The writer says that he is nonetheless content with his career and that sales don't matter to him one way or another. ``I've already exceeded my (career) expectations," he says. ``I don't care if my books sell well. The writing itself fulfills me." He has also adapted by making sure that if his books aren't read, they are seen on the big screen. 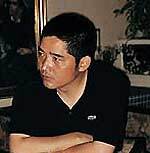 Three of Su Tong's books have already been adapted for film, including ``Raise the Red Lantern," ``Blush," and ``Rice." Shooting of a fourth project titled ``Jasmine's Blooming" starring well-known Chinese actors Zhang Ziyi, Joan Chen and Jiang Wen recently wrapped up and the film is currently being edited, Su Tong said. Su Tong is a featured speaker in this year's Singapore Writer's Festival, which runs from Aug. 21-27, and is hosted by the island nation's National Arts Council.